Pause next to wagon ruts leading into Ruby Valley along the Hastings Cutoff. Look ahead at the barrier formed by the snow-covered Ruby Mountains. After so many miles of dry sagebrush, appreciate the abundance of water flowing down icy streams, and enjoy watching a spring add its clear water to the Ruby Marshes. Watch steam rising from Sulphur Hot Springs, and imagine the approach of a group of Western Shoshone. Stand at the site of historic Fort Ruby, beneath the expanse of juniper/pinyon pine woodland. Look up at the summit of Overland Pass that carried pony express riders, mounted cavalry and stagecoaches. This book follows two historically important trails, the Hastings Cutoff and the Overland Trail, through the lush Ruby Valley. 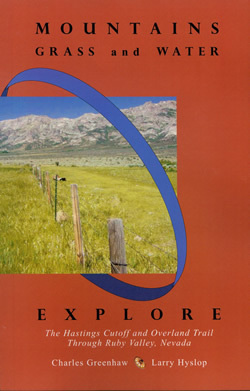 Beginning at the valley’s eastern approach, historian Charles Greenhaw describes the vivid history of this valley shadowed by 11,000-foot peaks of the Ruby Mountains. It is a valley once visited by such western notables as John Fremont, Kit Carson, Lansford Hastings, George Donner, and Samuel Clements. Wagons followed the Hastings Cutoff the length of the valley. The Pony Express and Overland Stage crossed the southern end of the valley. Diary excerpts bring alive the appreciation of early travelers for the valley’s ample supplies of grass and water. Maps and route descriptions help historical time travelers visit sites throughout the valley.